Colibri® ColorMatch is efficient, powerful and easy to use. It ensures accurate matching of opaque, translucent and transparent colors as well as of metallic effects. The new, easy-to-use web-based color feasibility function adds an extra dimension to color matching. It helps to ensure color consistency across a wide variety of technologies, substrates and applications, even if the user has limited technical know-how. You can select your method (by searching for a color or via the measurement function), your colors, your application and your substrates, add colors to the color cart and calculate feasibility by viewing colorimetric details, costs and real recipes – all in 5 easy steps, wherever you are in the world. This novel tool allows you to view your color recipes, catalogues and standard collections in the CIELAB L a b or L C h color space. You can even add multiple color sets and view overlapping color gamuts. The 3D color gamut viewer displays true color hulls and color points and enables you to follow the color travel of your effect pigments. It helps you to identify and reduce the number of similar products in your range as well as to spot the gaps in your color space, facilitating the creation of new color products for your market. 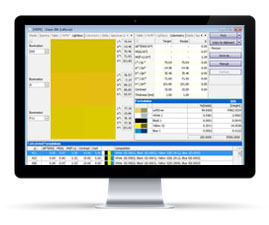 Thousands of recipes containing your specified colorants can be calculated using pre-defined application templates. This optional connection to Enterprise Resource Planning (ERP) systems allows easy scaling from a one-seat solution to an enterprise system with several hundred users and a central database.